His Eminence the religious authority; Sayed al-Hakim recommends the servants and visitors of the holy shrines to be trustworthy and sincere to reflect the bright image of the Shiites to the world. 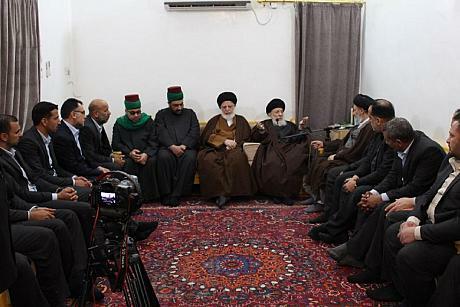 Sayed Mohamad Sa'id al-Hakim has recommended during his meeting with a delegation of the staff of the al-Abbas's (p) holy shrine that he received, the servants and visitors of the holy shrines to be trustworthy and sincere to reflect the bright image of the followers of Ahl al-Bayt (peace be upon them) to the world. At the end of his speech, Sayed al-Hakim prayed the Almighty to help them in this great service and to spread the success upon the believers for the good in this world and in the hereafter.